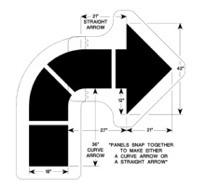 Straight arrow 42" x 42"
Curve Arrow 66" x 66"
Our Tough stencils for painting local Walgreens business parking lots. Check back often as new stencil are being added. Our Tough stencils for Walgreens parking lots are more flexible and heavier than other stencils allowing them to conform to any smooth or rough surface that needs marking. You always get the sharpest, most accurate stencil markings possible. Our Tough stencils make cleanup a snap: When the paint dries it simply flakes off! Our Tough stencils are simply the best stencils made, cut from 1/8" plastic and are the only stencils backed with a LIFETIME WARRANTY.